Discounts, deals, coupons these are some words which attracts every person who buys things frequently. 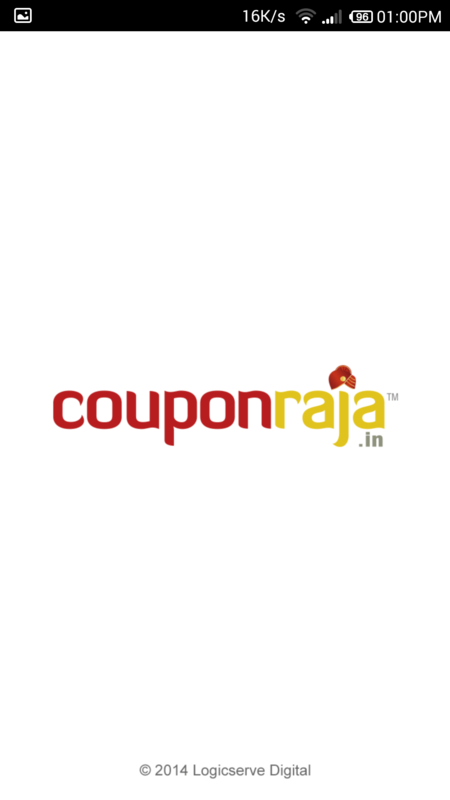 All the Indians must be familiar with Couponraja website, and if not then you should check it out now. It has some great collection of coupons on major brands and websites that we use daily to buy stuff. By stuff i mean it can be anything a product, something to eat, movie tickets etc. Initially they had a website where you could browse for coupons and redeem them. But now they have also launched a mobile app from where you can search and redeem coupons. The app is available for Android, Windows and iOS platforms. How to get the mobile app??? Once you open the above URL you will find all the links for the CouponRaja app on different platforms. You can also send an SMS containing the link to your mobile number. Just download the app on your mobile and SAVE when you are on the go. When you first launch the app, you will see different icons like top coupons, new coupons, cashback offers, signup offers, coupons for him, and coupons for her. You can select the icon according to your need. Once you go inside any offer, you get coupons from different dealers. After selecting a specific coupon, you can redeem it right from the app. The merchant website will itself open up in the app, which is one of the best features of this app. No need to copy the code and launch browser app and then redeem. Apart from the icons, we also have e-stores and categories section in the left side bar. You can directly search for some favorite e-store website like flipkart, myntra, domino’s etc. In categories we have men’s section, women’s section, electronics, food and drink, travel etc. If you are still facing problem searching for the right coupon, there is option for searching too. Well if you ask me, I found the app user friendly and useful. If you still find any bug, feel free to contact coupon raja right from the app. Filter coupons by e-store and categories. These were some of the awesome features of coupon raja app that lets you avail all the benefits of the website directly from the app. So save while you are on the go. If you face any difficulty or find any bug, feel free to mention in it in the comment section below. be a great author. I will remember to bookmark your blog and will often come back in the future.